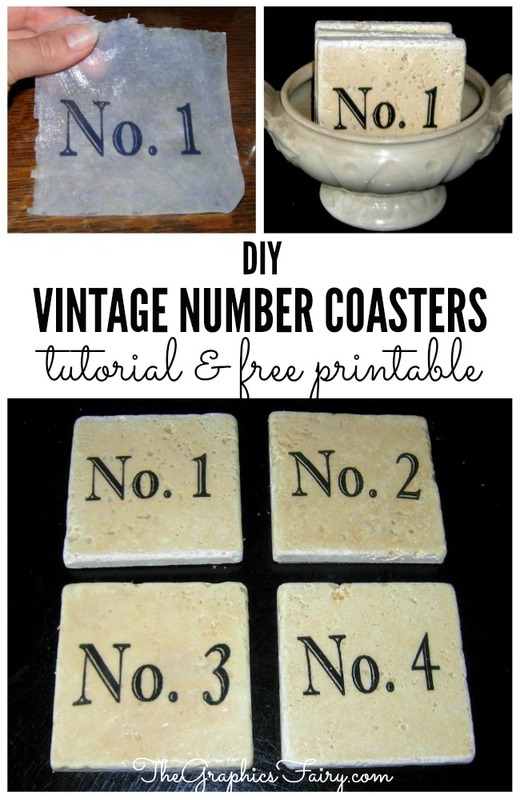 Omni Gel Transfer Method – Make Vintage Number Coasters! 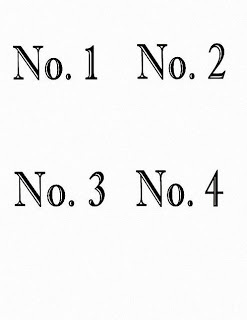 A couple of weeks ago one of my readers had requested additional number graphics, from the pair of numbers that I used in this post here. I decided I would offer the numbers here, but also thought it was a good opportunity to use them in a fun project as well. 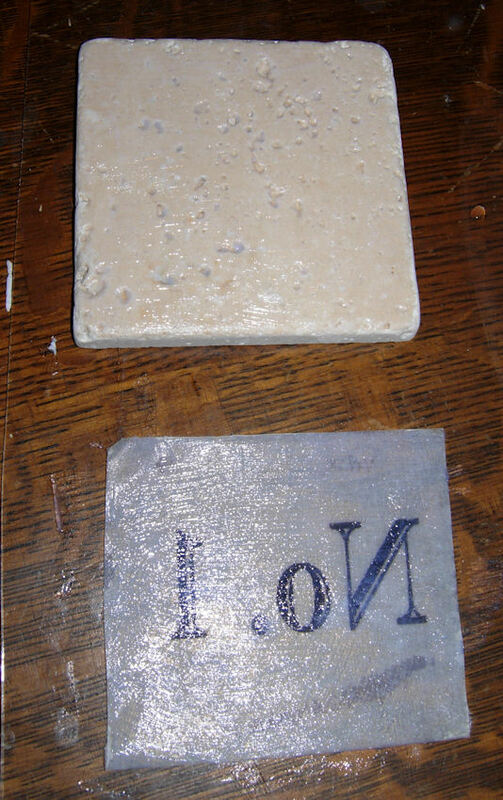 I used the graphics to make this cute set of Vintage Number Marble Coasters and I used a fun Transfer Medium Product! 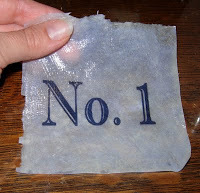 Step 2: You will need to brush on 3 coats of the Omni gel Transfer Medium. Brush the first coat in a horizontal direction, let dry completely. Brush the second coat in a vertical direction, let dry completely. 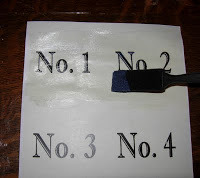 Brush the 3rd coat in a diagonal direction, and again let dry completely. Step 3: Sorry forgot to photo this step! 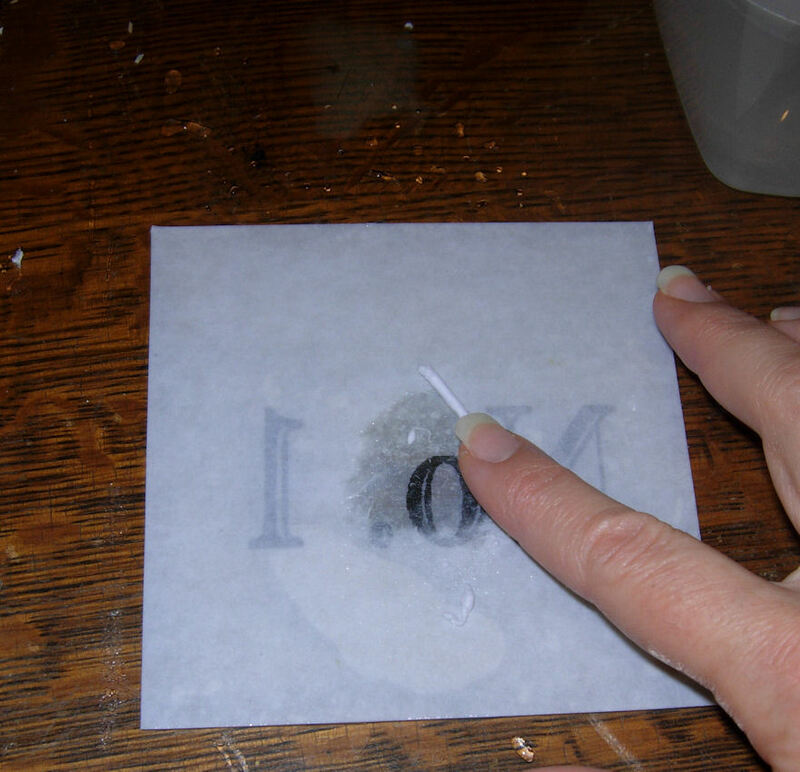 Cut image to the size of the coaster and then soak in a bowl of water for 10-20 minutes. Step 4: While paper is still wet, rub the paper backing with your fingers in a circular motion to remove all of the paper leaving just the gel transfer behind. Step 5: This is what your left with. The ink is trapped inside of this vinyl looking piece. Pretty cool!! At this point you can trim this up with scissors if you have ragged edges like I did here. 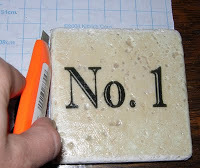 Step 6: Use more of the Omni Gel as a glue to adhere the transfer to the tile. I coated both the top of the marble and the back of the transfer. Step 7: Press the transfer down and smooth out to get rid of any air bubbles. 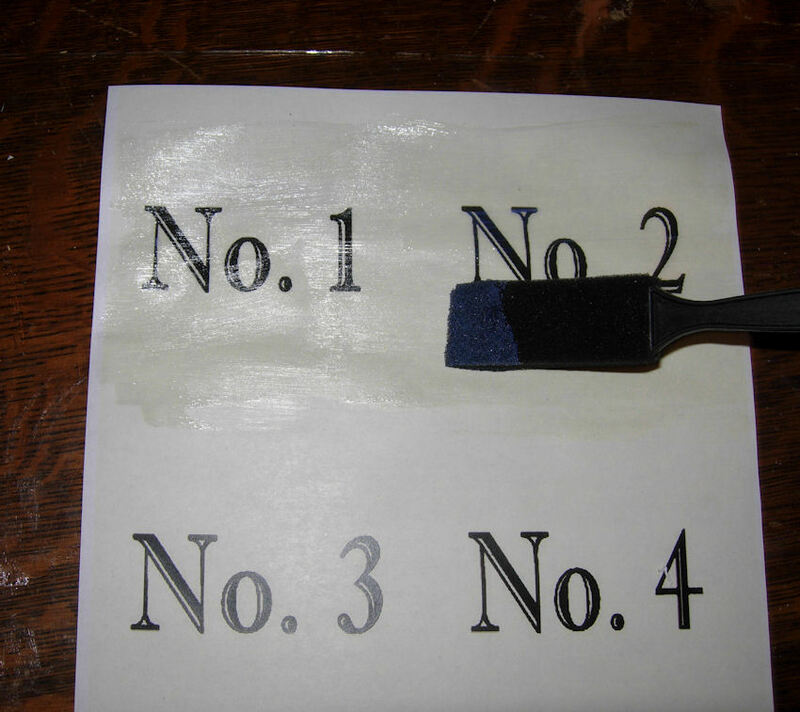 If you have a brayer this would probably work even better. I have one but… couldn’t find it. Oh well! 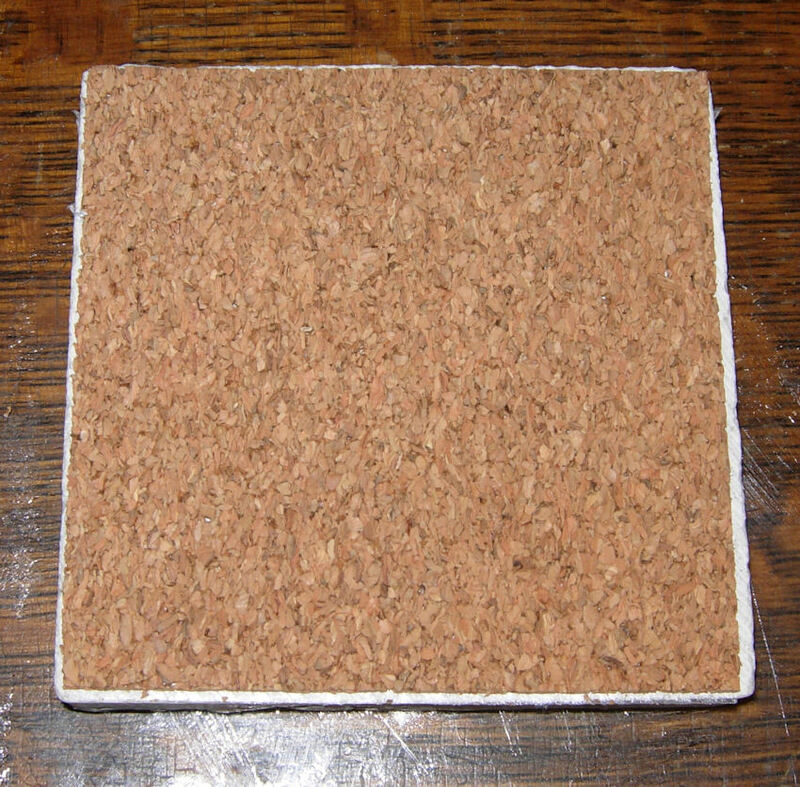 Step 8: Roll out the adhesive backed cork and lay the tile on top. Then cut to fit. I used a utility knife for this one, but scissors work just as well. 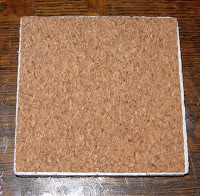 This cork is made by “contact” and it has a nice grid on the back, which makes it easy to get it just right! Step 9: Smooth down the cork with your fingers. Now your done!! 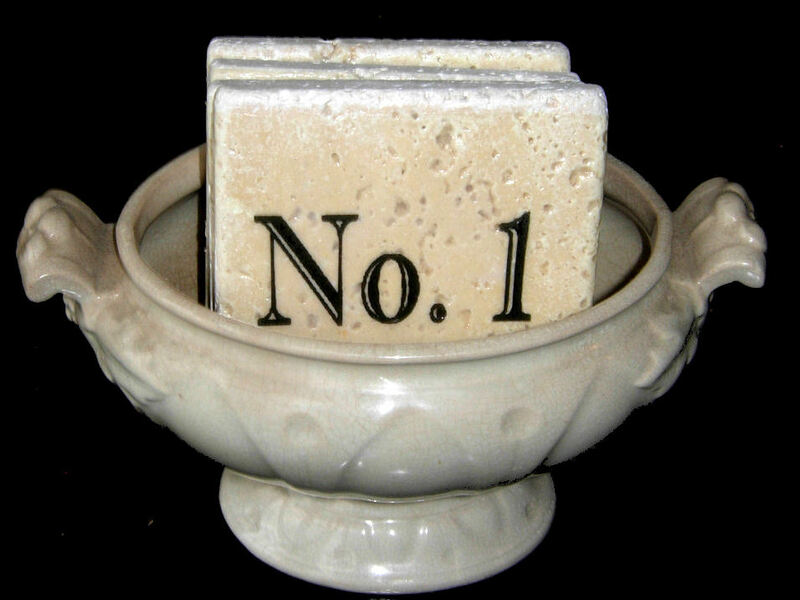 I’m storing mine in a small antique Ironstone tureen for now. I hope you like this easy project. 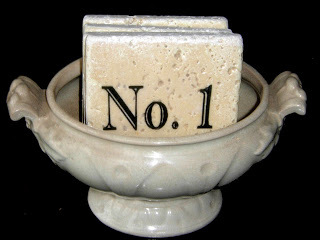 These would make a great gift for the holidays, I think they would also be a good item to sell at craft shows etc. This is such a wonderful idea! I have never heard of this product, but it looks like something else I could use for making glass platters. Thanks so much for sharing. Cool project – they came out so nice. I’ll have to try the Omni Gel. Thanks for the tip! What a super project! So nice of you to share your talents with everyone! I think so. I will also try. I love these and your tutorial looks so easy! Such a great project and I LOVE the number graphics. 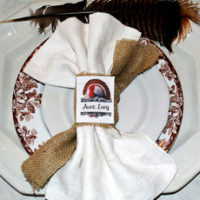 I made coasters like this using vintage images of my grandparents…they made great gifts for family members. Love all of your graphics and ideas…I need to get busy in the studio again….I’ll try and get something done for next week’s Brag Monday. I love this idea! I am sooo doing this! What a great Idae! 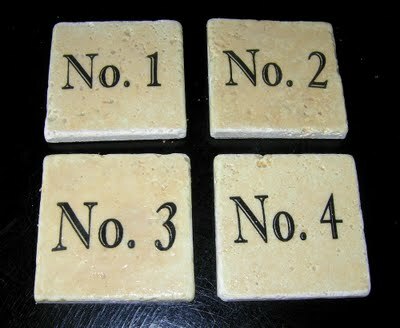 I actually use my leftover backsplash tiles as coasters, but never bothered with the cork or decoration! So much nicer! I have those! Except mine have my initials on them. A friend made them a few years ago using permanent pigment ink and stamps! Very cool. 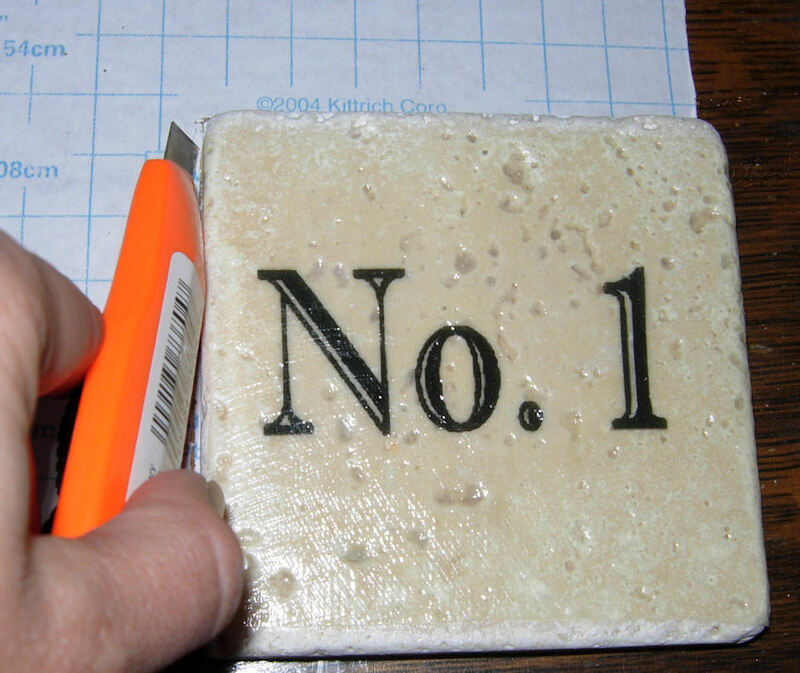 What a fun little project…I like those rub-on letters, but haven’t ever tried a coaster. Good idea. 🙂 Thanks for the visit! What a great look! Those WOULD be perfect gifts! Great job…and thanks for the PDF! LOVE IT!! I am sooooooo making these for someone this Christmas! Oh my! I LOVE your blog. This is just whatI’ve been searching the internet for. Thank you for offering all of the these wonderful graphics for free. I’ve become a follower and I’ll be sue to link to your blog as a source when I use a graphic in one of my projects. I have a few up my sleeve. Thanks! These are so fun, I love them! I love the coasters, they are just so cool, you are just so creative..Numbers are just so hot right now, I loved the way you have used them…I am a new follower and I will be back…come visit..
Oh how cute! Luv what you have done here and thanks sooooo much for sharing…you have an awesome blog! I had no idea that could be done. I’m always learning something new here! Thanks for the pictures and directions. I love these! I have been looking for coasters and hadn’t been able to find any. It’s my first time to your blog! I’m a follower! It is cute; seems everyone is going number crazy!! These are terrific! Great tutorial too. Oh my goodness, those are fabulous. Thanks for the great directions, I’ll give this a try! What a great idea!! That gel medium stuff looks way cool! Wowza!! Such a great project, with attention to detail. This is Brilliant Graphic’s Fairy. You are a clever girl and a giving Fairy!! Merci bien. does this mean the copy must be on photo type paper or done on a printer other than an ink jet. thank you. This is a great idea for “recession friendly” Christmas gifts. Oh it would be great for those “surprise gifts.” I know what I’m doing this weekend! Karen This is a great idea! And it would work with ANY of your beautiful graphics! Oh the wheels are turning! Fantastic! 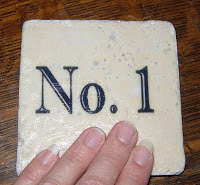 I have been putting stamps on coasters, but this is something new and fun. Thanks for sharing! These coasters are so amazing! I’ll be featuring tomorrow! Great idea. 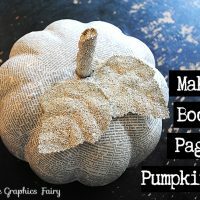 I continue to be amazed at all the great projects crafters do and how caring and sharing they are! Thank you so much. I love those numbers and tried to download them for a project … however the link leads me to a google group and even if I become a member there is nothing to download. Am I doing something wrong or does the link not work anymore? Thanks for letting me know about the link! I just fixed it, so it should work for you just fine now! Karen, have you tried the Omni gel on glass? I want to do something similar but with labeling jars in my kitchen(that can be hand washed). I have not tried it on Glass, but I just checked the bottle and it says you can use it on glass! Hi, I was wondering if anyone else had trouble with the image in the gel ripping as you were trying to get all the paper off the back? I’ve tried 3 times, making the gel layers thicker each time, and no matter how gently I try to remove the paper, it rips. Any suggestions? Hmm, I’m not sure why that’s happening. 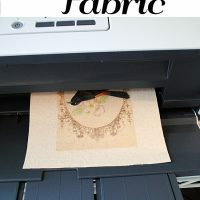 What type of paper are you using? I just use regular printer paper. Love these! I think I’ll make some coaster sets for some gifts! Great directions! I suspect I could even use something similar on EEEBCI projects on my DIY page (Easy Enough Even Bill Can Do It) Better known as husband craft tested for easiness! Thanks. Hi Karen, I have been wanting to try something like this with some bird images from your site. Unfortunately I have not had any luck finding Omni gel in any of the Michaels stores in my state. Do you know if Liquitex Gel Medium would do the same? I hope the answer is yes since I have been wanting to make these for a long time now. Thanks! I have an update. I found Omni Gel on Overstock (yes!). What I discovered is that if the image has white parts to it and I apply the transfer to an ivory colored tile, the whole tile takes on a antique look, not bright colors. Yours look great because the numbers are black. I will try this again with some brighter images. Thanks again for the great inspiration! Thanks Rkramadh! You can also find it at JoAnne’s! Hi Karen, I love these coasters and can’t wait to try this project. I am not familiar with omni gel and I have a question about it. When the drinking glasses leave rings of moisture on the coasters, does the gel ever become soft again? Did you ever put a sealer on them? If so what kind? Apparently no one at Michaels, AC Moore, and JoAnns have heard of Omni Gel…can only find it online. Does any type of sealer need to be used on them to protect them from moisture from the drinks? BTW, I absolutely LOVE your site. I have the same question about photocopy. What does that term mean? I have a laser printer and just bought an ink jet printer, would the laser printer work? What kind of paper? Anyone ……..??? Thanks! These are so cool! Love them! A question I have is, can you use a picture with color in it?Or will that not transfer? I noticed all of the images are black and white images. I am guessing the color would not transfer well, but was curious. Thanks so much for the download will use them with waterslide decal paper, will use the sealing sheet so it will be washable. Going to put them on the drawers of my grandaughter dresser i am doing. Thanks so much for sharing your work. What kind of brush should I use for the omni gel because I have brush stroke marks on my image and how to I disguise the border of the image when I place it on a piece of furniture so that it looks painted on and not just glued on?? Hi Ginger, it’s been awhile since I’ve used this technique, but I think I used a foam brush. The best way for it to look natural, is to take the product all the way to the edge, so that you have an even sheen all over. I would stick to small pieces of furniture, as you will go through a lot of product with larger pieces using this technique. I hope that helps! You say that inkjet printers will not work for.this method… what printing do you recommend? Also what should the graphic be photocopied onto, normal paper? Hi Tess, Just make a photocopy of it at a copy shop, like Staples or Office Max. The standard paper that they use in the machines work just fine! I am VERY excited to make these for my wife as a Christmas Gift. One question I have seen conflicting advice on…Do you use the actual image or do you use the mirror image? I think it is the regular image, but don’t want to make a mistake. That’s great Anthony! The Omni Gel is reversible! Since it’s clear you can use either side. I think one side is more shiny and one site is more matte, so you may want to play around with a test piece and see which side you prefer. Thank you so much for the quick response! I will experiment with the shiny/matte options. I understand that you recommend just working with the “full sized printable PDF” image as opposed to the “reversible printable PDF” option you have on your site. Hi Anthony, You can use either one, depending on the type of project that you’re doing. They are both the same size and quality. Could this be done on wood?? Has anyone sealed these? Should they be sealed?